The module is almost ready, only minor tweaks left. What do you think ? Impressive snare sounds out of your new module. I like it. Good work. I like it. Reminds me a lot of the Nord Modular drum modules, in terms of the range of sounds one can achieve (I'm listening through laptop speakers, though). I used to do some crazy drum stuff with my G2. Really like this - I'm hearing everything from 909 to 606 snares (my faves) pls a lot beyond that too! Sounds great! Now that we're getting some drums in MU, what do you guys think is the best drum-friendly sequencer available? I feel like a SimpleSeq per drum would be pretty cool for triggers and 'param-locking' something per step. I use a beatstep pro , is not MU but it works great for triggering the modules. It has 8 drum channels an 2 sequencers so you can use the sequencers for modulation purposes. My initial reaction to just the photo was is 2U width really needed just for a snare? But after hearing the range of sound coming out of it I bit my tongue. to my ears(only heard this demo).. comparing it with some of the Drum machines I have.. ..it could have a snappier attack.. for new school tech type stuff.. the attack transient is slightly long..
the timbres you can get with your module are great.. but personally the attack and possibly the envelope shape would put me off a bit..
having both the tanzbar and the DRM 1 mkIII the envelopes on the Tanzbar make it much more the go to.. the DRM sonic scope is incredible but how they work as drum units the tanzbar just has that magic feel..
Yeah, if I'm going to buy drum modules, I want ones that give you a lot of control and modulation options. This looks interesting. OHHHH HERE WE GO AGAIN!! I took the time to play the clip backwards....I was shocked at the message I heard!! "This module will be released the day before your biggest monthly payment comes due"
The nerve of some people....guess you will be getting a paypal notification the day before my house payment.....Jerk! sounds awesome...keep it coming, I want my Corsyth drum machine!! This seems like a happy medium between a typical drum module (with just the basic decay/tune controls) and something like Basimilus Iteritas. I'd definitely prefer 3-4 very configurable/CV-able modules over a line of 8 simple modules for every drum type (might as well use a standard drum machine at that point). I guess DR-03 would probably be Hats/Cymbals and after that...only Pablo knows! About the double size panel, the snare is one of the most complex drum sounds to synthesize. Normally in most drum machines only a small fraction of parameters are available to tweak by the user. The philosophy behind the DR series is to offer modules that are able to offer a wide range of sounds and to do that you have to put most of the important parameters in the control panel. Nice to see dedicated 5U drum modules!! I would have loved to have control over those 4 A/D envelopes, though... those can make a beat come to life without loosing the timbral content. I like to use unsynchronized LFO's for that kind of thing. You could CV this snare to be hihat AND snare that way easily by having very short hits in between the longer snares. Actually... now I'm looking at the panel and the CV ins might as well affect the decay??? I'm assuming, from the input names, they affect filter cutoff... ??? I though about vc envelopes but it complicates a lot the design :( . In case you want to do what you have described you can always use my C106 and an external VCA. Just patch the ouput of the DR-02 to the VCA and control the decay with the C106. LPF and HPF : affects the filter cuttofs , again you can use to add dynamics to the sound or to create crazy sounds. I have to agree with Dob, the main thing I would want to sequence on a snare drum is the decay/intensity, followed closely by attack (to mix in some brush & shaker type sounds). I'd give up one of those filter CV inputs (or maybe the filter jack could affect both HP & LP together?) Or even the tune jack - since I'm typically not adjusting snare tune during a sequence - but that would be a last resort. I know the design is pretty much complete, but something like an intensity knob/jack could be cool - affecting decay, filter brightness, volume, and very slightly pitch all in one. At this moment the design is basically closed only minor tweaks left to do. As I said , adding vc envelopes would complicate too much the circuit and it is already quite complex, I know is a good feature but in this stage is impossible to add. The tune cv for me is the most important and useful cv input in the module. Audio modulation opens the gate for crazy sounds and FM sounds like the example below. The sound comes from just one DR-02 been modulated. Didn't even think of FM-ing it, yep you need that tune CV! Today I've been recording the official demos for the module and I've put together a video with some of the loops that I've recorded. The demos were multitrack recorded and mixed , no FX or compression was used. Individual tracks are played after each loop. All sounds were created using the DR-02 , some auxiliar modules were used as modulation sources but all the audio comes from the DR-02. As you can see is capable of much more that just snare drums. Cannot wait for this. I have two dr1. SSSSOOO excited! 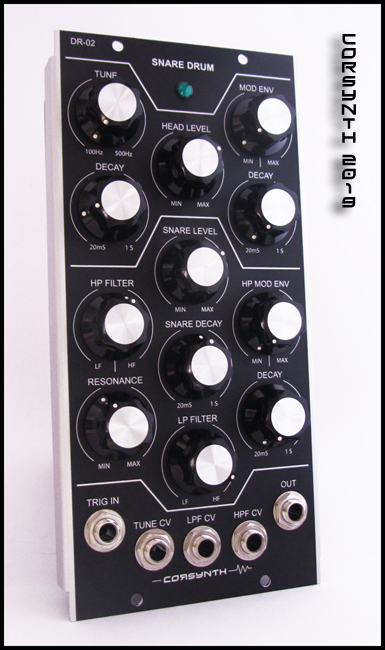 Pablo, any thoughts about effect/filter modules? It doesn't seem to be the popular choice anymore, but I am still partial to the Moon 563 for this sort of thing. You sacrifice memory and steps, but the 563 switches feels like the more playable interface, particularly with it being so quick to set a reset at any step. I have two 563's vs. zero 568's now, despite thinking the 568 was pretty cool. Two of the little guys just seemed like the more versatile choice for my use. And the 563 is super cheap in comparison.